7:00PM→ 6th extinction event at Traditions. Come and celebrate the great extinction. Potluck at Traditions. We don't want to go extinct hungry, right? Really Really Free Market will be there. Clearly the time for unified action is NOW. 1:30PM: Port Plaza Earth Day Rally! 2-5PM: Bee at the Procession Studio! 6:45-7:15PM: Rally at City Hall for a Carfree City! 2:30-5:30PM: Non-Violent Direct Action & Blockades Training @ Earth Fest! 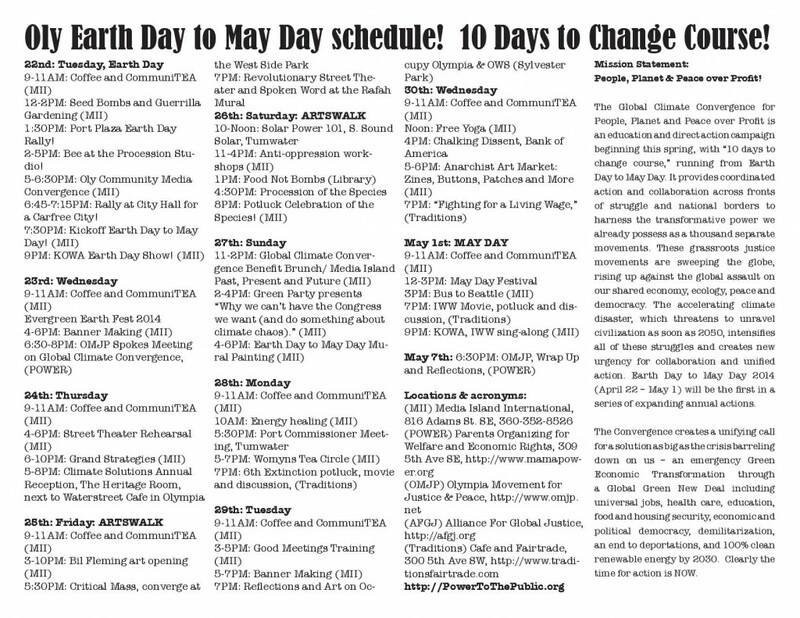 The Global Climate Convergence for People, Planet and Peace over Profit is an education and direct action campaign beginning this spring with “10 Days to Change Course” running from Earth Day to May Day.Together we can harness the transformative power we already possess as a thousand separate movements for justice, rising up against the global assault on our shared economy, ecology, peace and democracy. The accelerating climate disaster, which threatens to unravel civilization as soon as 2050, intensifies all of these struggles and creates new urgency for collaboration. The Convergence creates a unifying call for a solution as big as the crisis barreling down on us – an emergency Green Economic Transformation through a Global Green New Deal including universal jobs, health care, education, food and housing security, economic and political democracy, demilitarization, an end to deportations, and 100% clean renewable energy by 2030. We normally have our OMJP meetings on the second and fourth Wednesdays of each month. We normally have our meetings at 6:30PM but we also have a practice to not have our meetings conflict with other progressive events in the community if we can avoid it. OMJP Meeting will be done by 7PM. We encourage all to go the Tory Davis event on Wednesday at 7PM at Orca Books. OMJP meetings on the second and fourth Wednesdays of each month. We will discuss recent past events and also future events that we are planning. “Olympia Free Space Assembly , 7:00 PM. This is a space to gather face to face and share projects and ideas, tell people what you’re working on and how they can plug in, and find others with similar ideas. There are already tons of great people working on great projects in Oly. Let’s get together!